Of all the family traditions we have, the annual pumpkin carving contest is easily the favorite and the most messiest of them all! Every year, we head out to the pumpkin patches and pick our favorite of the bunch, and then head home to carve them. The kids draw on original faces and scoop out the goopy pumpkin seeds. After the pumpkin is set, we wield the knives to carve out each face carefully by design. It’s become a pretty huge deal to see who wins and gets to keep the trophy displayed for the entire upcoming year. Everyone in the family competes, and then we vote on our top three choices to be in the finals! 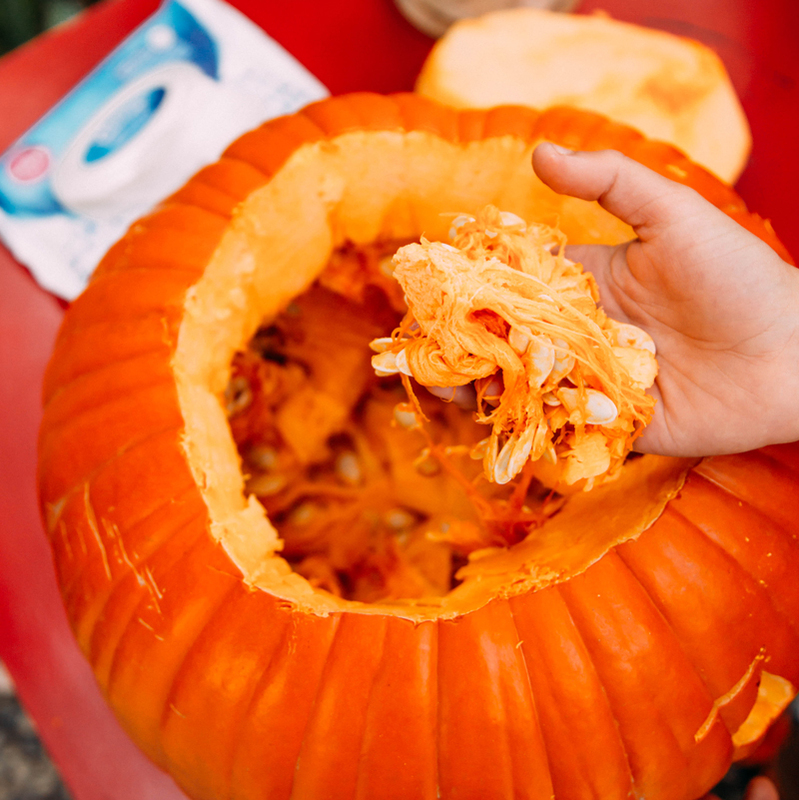 Our pumpkin carving contest is a pretty big mess, as you can tell, but it’s no worry with Kleenex Wet Wipes. 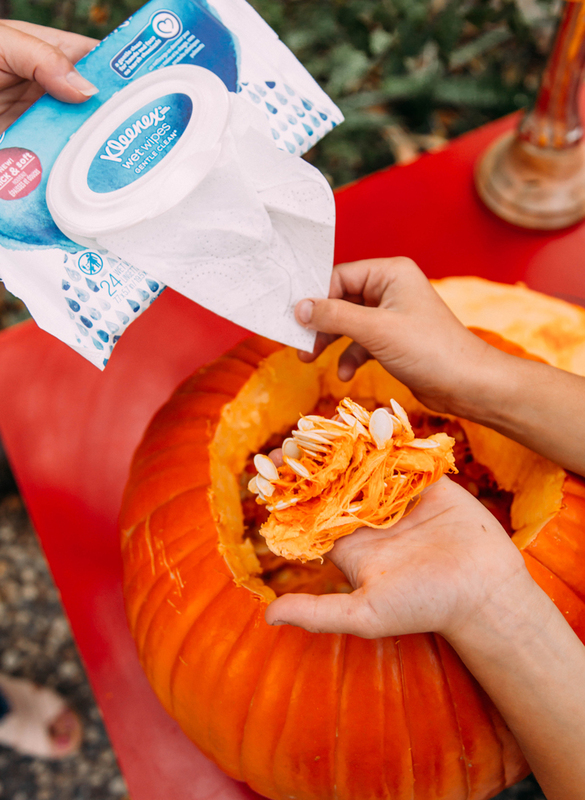 Using the wipes allows us to go from pumpkin picking, to carving, to displaying our prized pumpkins without any trace of lingering pumpkin goo or dirt from the patch. We keep Kleenex Wet Wipes nearby while carving so we can easily wipe down pumpkin covered hands as we go, which saves our house from being overrun with pumpkin guts as the kids run back and forth to the bathroom to wash.
We also take the wipes along with us to the pumpkin patch, making a day of playing in the dirt so much easier! We’re always sure to wipe down the pumpkins, hands and even that rusty wheelbarrow before we take a ride. Once home, we dig out the gunk, pop the seeds in the oven for a quick snack and get to carving! It’s fun to see the kids get so excited about creating something of their own for a friendly competition. They get such pride in the pumpkins they design! After drawing and carving the pumpkins, we share the finished products with some unbiased judges to help decide which pumpkin is the best based on creativity and execution! To do this, we have our neighbors (and this year Facebook friends too!) 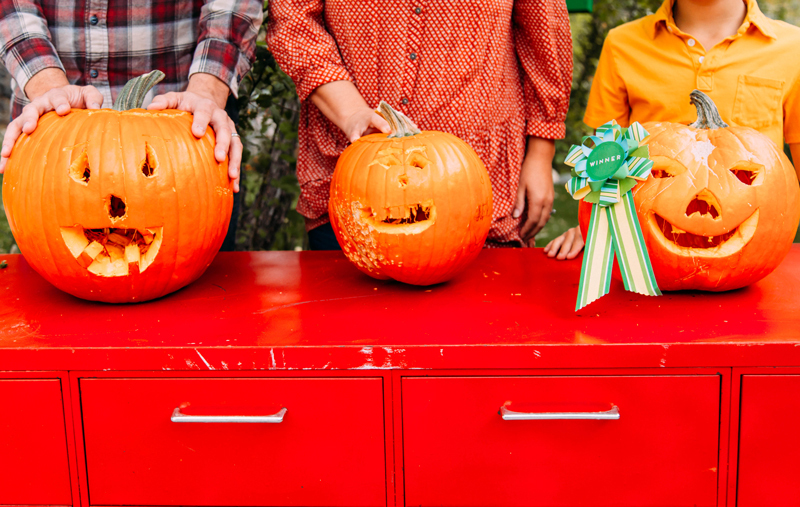 vote on 3 of their favorite finalists to see whose pumpkin wins the grand prize. Whoever wins it gets the cash prize ($5 is a pretty big deal when you are 9 years old), and the chance to display the trophy in their room for an entire next year. Sufficient to say, winning has become a very big deal in our family ;). 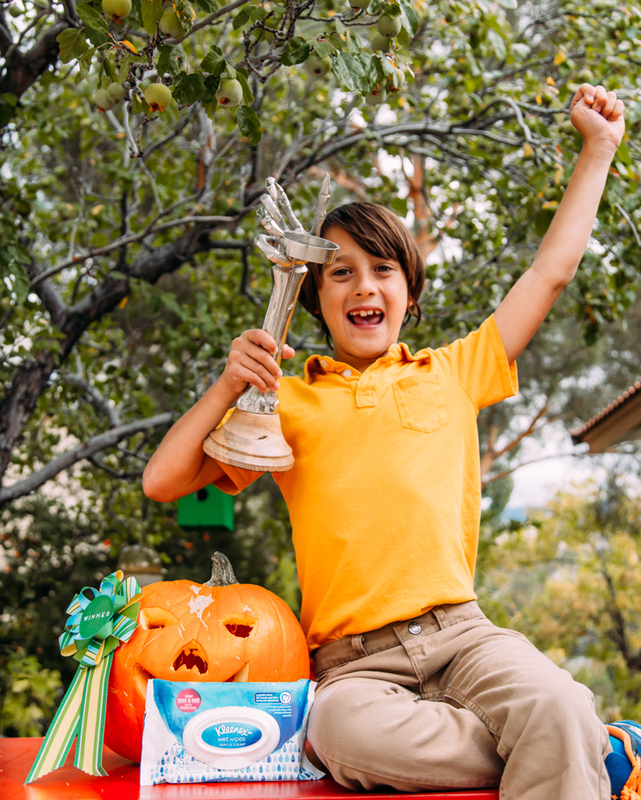 After a lot of work and a tough competition, that trophy now belongs to my son until next Halloween season. I love family traditions like this one that we look forward to all year long. 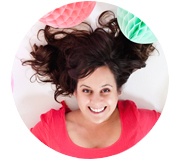 They make the season just a little more fun and inspire my entire family to create and craft at their best. 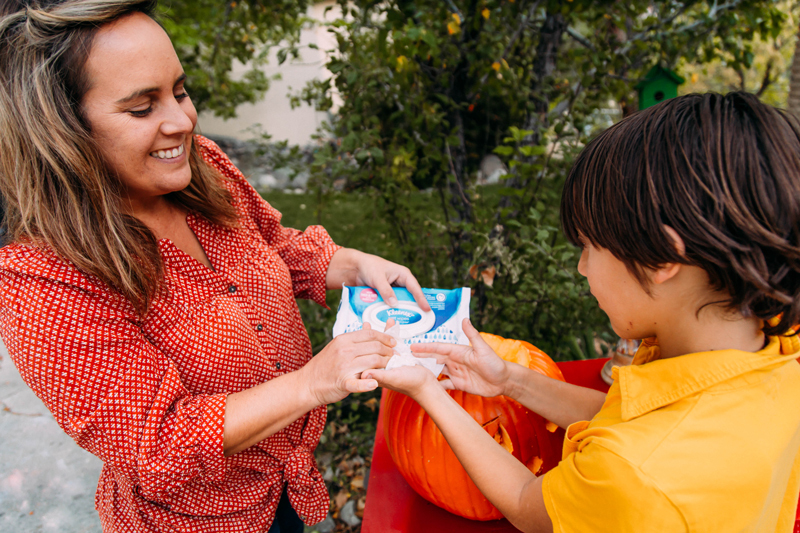 I also love that the Gentle Clean Kleenex Wet Wipes great at getting off all the messy fun fall festivities we dive into but are easy on my kids skin as the months get a bit colder and dryer. 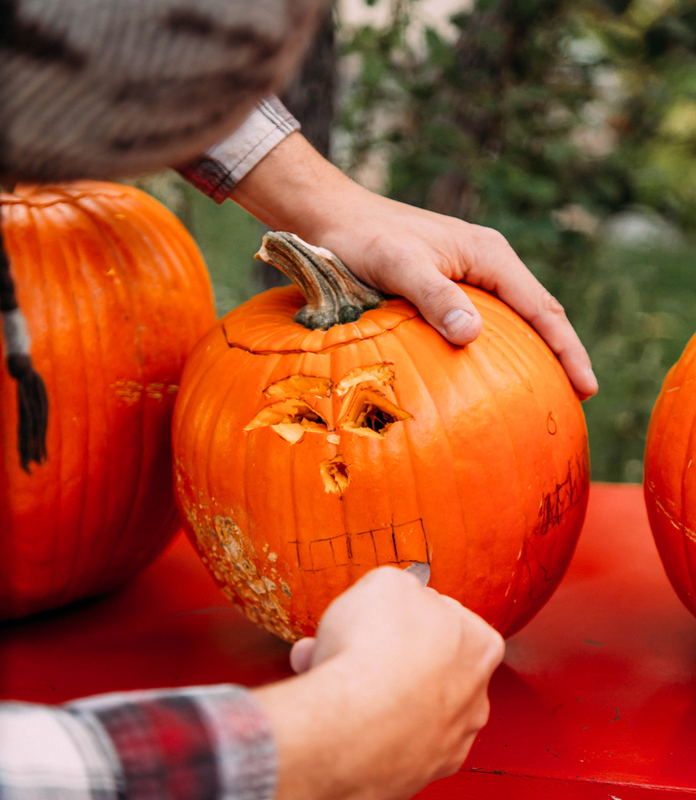 Ready to get your family’s hands dirty and start an annual Pumpkin Carving Competition? 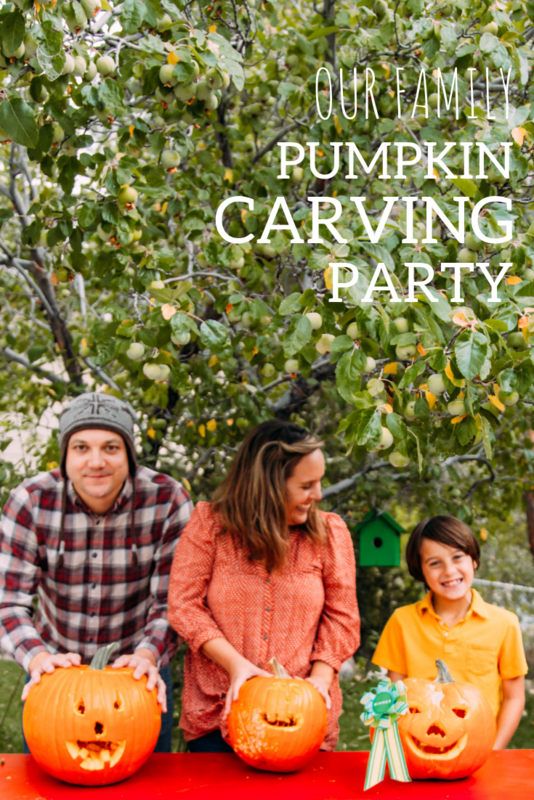 Follow our tried-and-true plan– picking, designing, carving, showing, voting and cleaning along the way– and you’ll have a fall family tradition for years to come! What a cute family activity! Hope you made good use of those pumpkin seeds ! You know we did. :) They are my favorite!